Food services and drinking places sales — N.L. Food services and drinking places sales — P.E.I. Food services and drinking places sales — N.S. Food services and drinking places sales — N.B. Food services and drinking places sales — Que. Food services and drinking places sales — Ont. Food services and drinking places sales — Man. Food services and drinking places sales — Sask. Food services and drinking places sales — Alta. Food services and drinking places sales — B.C. Food services and drinking places sales — Y.T. Food services and drinking places sales — N.W.T. Food services and drinking places sales — Nvt. On a seasonally adjusted basis, sales in the food services and drinking places subsector decreased 1.0% to $6.1 billion in January. Sales were down at full-service restaurants (-2.1%), limited-service restaurants (-0.5%) and drinking places (-1.2%). Sales increased at special food services (+2.1%). Sales were down in eight provinces in January. The largest decreases in dollar terms were in Quebec (-2.5%), Alberta (-1.6%) and British Columbia (-1.2%). 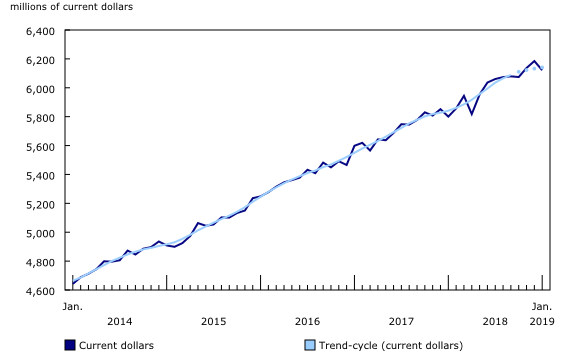 The largest increase was in Manitoba (+1.2%), following a decrease in December 2018. Further information can be found in the dashboard entitled "Food Services and Drinking Places Sales." This web application provides access to data on the sales of food services and drinking places for Canada and by province and territory. This dynamic application allows users to compare provincial and territorial data through interactive maps and charts. The figures in this section are based on unadjusted (that is, not seasonally adjusted) estimates. Unadjusted year-over-year sales in the food services and drinking places subsector increased 5.2% in January. Sales in each of the following industry groups increased: limited-service restaurants (+5.0%), full-service restaurants (+4.8%), special food services (+7.2%) and drinking places (+8.8%). Sales were up in every province and territory, with the largest gains in dollar terms in Ontario (+6.1%), British Columbia (+6.5%) and Quebec (+5.2%). Prices for food purchased from restaurants were up 3.5% year over year in January, while prices for alcoholic beverages served in licensed establishments rose 3.3%. All data in this release are seasonally adjusted and expressed in current dollars unless otherwise noted. For information on seasonal adjustment, see Seasonally adjusted data – Frequently asked questions. Data for the current reference month are preliminary. Usually, unadjusted data are revised for the two previous months, and seasonally adjusted data are revised for the three previous months.